Just about every iPhone user loves the iPhone, but if there is one thing to complain about it’s almost always about the devices battery life, or rather, lack thereof. Nearly all who use their iPhone constantly will offer some variation of this complaint, and for many of us it’s the first iPhone that has to be charged throughout the day too, rather than charging it exclusively overnight and having it ready to go for the next day. Being dependent on a wall charger is never fun, so we’re going to focus on some tips that are actually proven to work that prolong battery life. As you’ll see, there will be a few potential downsides to some of these methods, and you’ll have to determine if a battery that lasts a long time are worth the tradeoffs. That won’t be the case for everyone, so just mix and match the tips that will work for your needs. These tips will extend battery life for all iPhone users and with all versions of iOS, but you probably don’t need to bother with any of this unless your iPhone battery life is actually suffering. It’s usually pretty obvious when so, because those of us impacted by the battery drain will have a battery at 30%-60% by mid day despite very light to moderate usage. If you’re not certain, you should run the battery down to about 5% and then see how long the battery has actually lasted by checking usage statistics, if what you see is only a couple hours of actual device usage, then you may have an excess drain issue that can be resolved by the tricks outlined below. Yes, this makes it harder to view the screen when outside in direct sunlight, but that’s a small price to pay to be able to use your iPhone considerably longer. 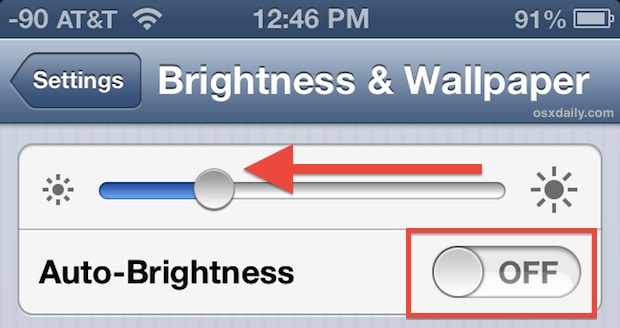 This settings change alone can easily add an hour or two, if not more, to battery life. You may recall that, despite some criticism, Apple didn’t adopt LTE immediately – and the hit to battery life is exactly why they waited. The iPhone 5 definitely gets better battery life than a lot of other LTE devices, but it’s still not great. If you don’t use LTE much, turn it off and your battery will thank you. For us data hungry folks, this hurts, because LTE is part of what makes the iPhone 5 so great. But unfortunately, using LTE networks causes the devices cellular modem to use more power, leading to reduce battery life. You can also consider turning it off and only flipping it to on when you actually need to do something quickly, but that’s a bit of a nuisance. GPS uses quite a bit of battery, and many apps use location for a variety of reasons. 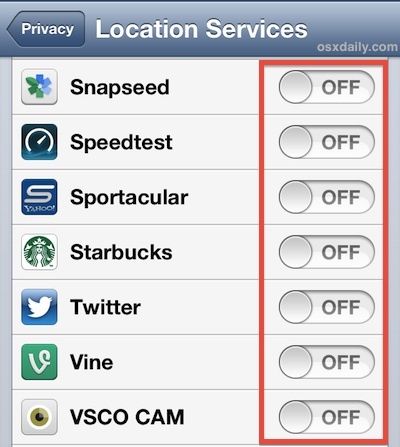 Thus, every time you open or use a location dependent app, it hits your battery life, which is why turning off as many location aware services as possible helps to prolong battery. Turn this off for literally everything that doesn’t absolutely require it (basically, Weather, Maps, Google Maps, and Find My iPhone, are all that should stay on here). You can also go the nuclear route and disable all location services completely, but if you try to use Maps for directions it won’t know where you are. 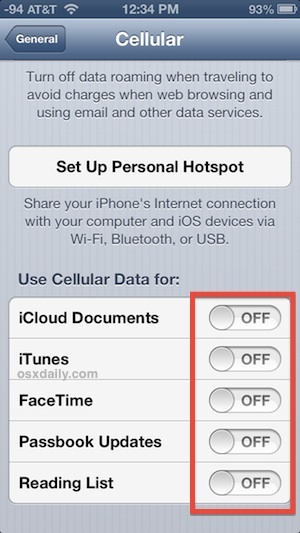 No, you’re not turning off cellular data completely (though that would help, but then your iPhone is obviously much less useful), instead you will turn off cellular data usage for items that just aren’t necessary, like updating iCloud documents, iTunes information, FaceTime, Passbook updates, and Reading List cross-device syncing. This basically means that none of those services will function or update while on cellular connections and will instead rely on wi-fi to update. This leads to reduced cellular modem use, and increased battery life. This means that your iPhone will no longer check for new mail on it’s own, meaning if you want to know if you have emails awaiting you, you’ll need to launch Mail app and do the pull-to-refresh gesture to check yourself. For those of us who need to get new emails as fast as possible, this is not really a viable option. One compromise is to disable Push, but keep Fetch on with aggressive settings to pull new emails faster, but that will still hit the iPhone battery. If you can afford to wait to manually check your emails, go the manual route for the biggest impact. Who uses Bluetooth all the time? Just about nobody, so why do you have it on all the time? Here’s what you should do instead: turn it off, and only toggle it on when you are actually using it for a headset or keyboard. Otherwise you’re both broadcasting the Bluetooth signal and searching for available devices even when it’s not needed, and that drains battery. Thankfully this one isn’t buried to deep so it’s not much of a nuisance to toggle it on and off when needed, and for many of us, just keeping it off all the time is hardly a sacrifice. Bonus! Don’t forget to turn off unnecessary notifications and Push alerts, which all cause increased activity on the iPhone and that can lead to a reduction in battery. Repeat this one as necessary, and in the future when new app downloads ask to allow Push Notifications, consider choosing “Don’t Allow” instead. Yes, there are tons of other battery tips, but ultimately the six offered above are going to make the biggest difference without getting too crazy with individual settings. Thank for your tips, i think Tip number 2 Turn LTE OFF is working well for me to extend the battery life. Oh, thank you very much for your sharing. Do you know that your post is what I am needing? I need a effective way to extend my iPhone battery life that actually work. Great 6 tips. My iPhone battery has improved well thanks to your post. I have done some of these, and you add more great tips for me to follow, thanks for sharing! I’ve tried all of those tips but my battery is still too weak! Is there anything else?